General Douglas MacArthur visits Milwaukee in 1951. General Douglas MacArthur rides down a Milwaukee street in 1951. Lake Effect's Bonnie North speaks with Chas Mulcahy, Deanna Alexander, and David Black about the General MacArthur Statue rededication ceremony. While today is the 70th anniversary of D-Day, 2014 also commemorates the 50th anniversary of the death of another World War II icon – with strong ties to Milwaukee. 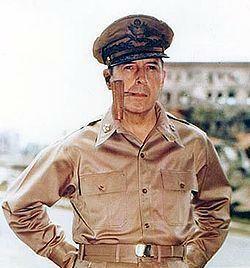 General Douglas MacArthur in Manila, Philippines. His statue will be relocated to the War Memorial and will be rededicated at a ceremony on Saturday June 8th. General Douglas MacArthur spent much of his early life here, graduating from West Division High School. A rededication ceremony on Saturday morning will mark the moving of the city’s Douglas MacArthur statue to its new home near the War Memorial. Chas Mulcahy is past chairman of the Milwaukee County War Memorial and organizer of this MacArthur Week – as well as the first one, held in 1979. Deanna Alexander is a Milwaukee County Supervisor who will speak at the event; and David Black will be a special guest at the event. He’s from Perth, Australia, who was a child when MacArthur came to that country to help defend it from Japan. The bronze representation of the former General of the Army has stood on a pedestal east of the County Courthouse since 1979.